In the same week, I came across two helpful articles about the same important topic: maintaining friendships with people with special needs. The second was a quarterly publication I get from my sorority. 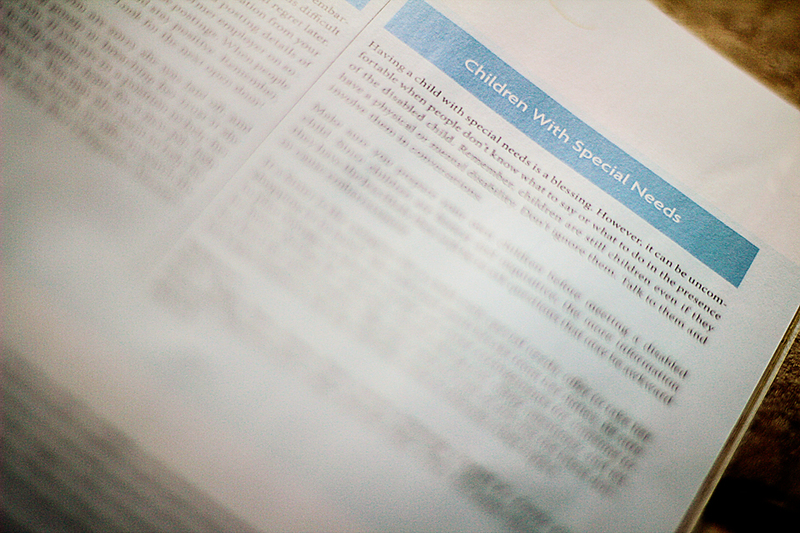 I know I can’t ever read all of it, but I always browse, because I know there will always be something to learn to help keep me “womanly always” and “discouraged never.” This quarter’s issue had a lot on the topic of etiquette, and I was pleased to see them cover the topic of children with special needs. Given this magazine goes out to all sisters of varied ages and stages in life, it warmed my heart to see practical advice on how to relate to these children and their caregivers: Speak to the children like you would any child, and be there for their caregivers without asking a lot of questions. Thank you, Sisters!